I first came across Terry Pratchett’s writing in the mid 1980s, children’s books such as the Colour of Magic and the Carpet People. It was quite clear then that Terry (one of the few authors about whom I feel very personally) showed a fabulous mix of humour and invention, mischief and plain silliness. I have probably read every one of his Discworld sagas, and have preferences for those tales based in the improbable Ankh Morpork, a city state at the centre of that fantasy world, riding on a disc on the back of 4 elephants, themselves standing upon a turtle swimming through the Universe. ― Terry Pratchett, Reaper Man. The modern world, as driven by politicians and the agents of government, is beset by the failures of its own machinery. It’s so obvious that targets corrupt behaviour, however well intentioned, as research after research proves. But put someone in charge, and they’ll quickly adopt a target setting approach, because of course, they will build a reward system around that from which they personally will benefit, if permitted. In the Disc world series of books, Prachett spotlights pretty much every industry, from the Police (who are central to so many Discworld novels, known as the City Watch), Film, Education, the Press and Tourism industries. My leading quote from Terry is well aligned to world book week, because it is through reading only that one can enter his Discworld, explore the multiple adventures of wizards and adventurers, male and female – DEATH’s adopted daughter Ysabell is a fantastic modern role model for feisty intelligent teenage girls for example. Without imagination, nothing can be achieved, except targets. 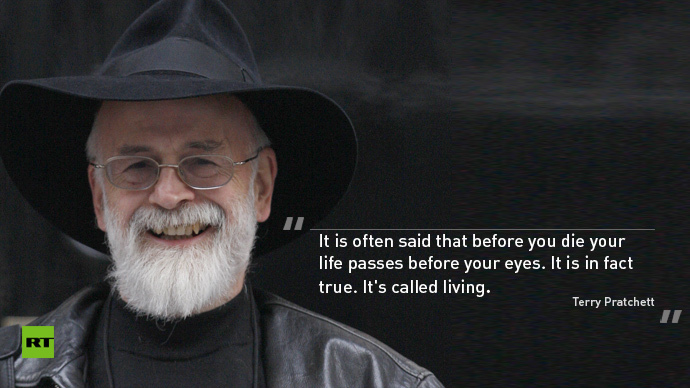 Now goals of course are different, and we can have plenty of those big, hairy audacious things in our lives, such as building a new campus or a vaulting ambition to achieve excellence in unusual ways, and I can but thank Sir Terry Pratchett for nourishing my life and nurturing my soul. When all is unfathomable and little seems to have purpose, a quick flight on the back of a large turtle and the world he supports helps give me both a new perspective and a resolve to do something for the children in my care or the staff with whom I work.